Following the emancipation of Texas slaves in 1865, Barrett spent several years gathering his family together. He eventually found all of them except one sister, and they settled on part of Reuben White's league east of the San Jacinto River and purchased the land for fifty cents an acre in 1889. It became one of the largest holdings in Harris County to be acquired by a former slave. Barrett named the property Barrett's Settlement. 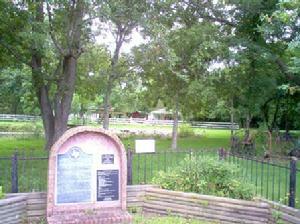 Harrison Barrett's homestead (as seen in the above photo), twice rebuilt by his descendants, stands on its original location. 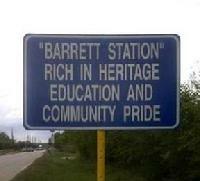 Barrett, Texas, as it is now referred to in modern day time, is primarily an African-American community with a rich heritage and known for its dedicated civic participation. Central to the community are area churches and key organizations such as the Barrett Station Community Development Organization, Inc., the Barrett Station Civic League, the Barrett Station Ministerial Alliance and the Barrett Station Health Advisors. A census-designated place in Harris County, Texas USA, this community is approximately 12.66 square miles in size, with a population totaling 3,199 according to the 2010 US Census. Click Here to Post Comments About this Site on Our Wall @ Facebook!